Fedora 18 was released on 15th January, and anyone eagerly awaiting Jam might be wondering how to get it. Fedora Jam was ready for the Fedora 18 release, but it didn't make it into the official release discs, you can instead get a preview of Fedora 19 Jam by following the instructions at the Jam wiki page. After a month and a half, how is the Jam looking? Here is a quick look at the Jam and a few tips for getting the best out of it. 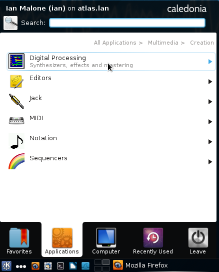 Most of the interesting things in Fedora Jam can be found under the Multimedia and Multimedia Creation menus. 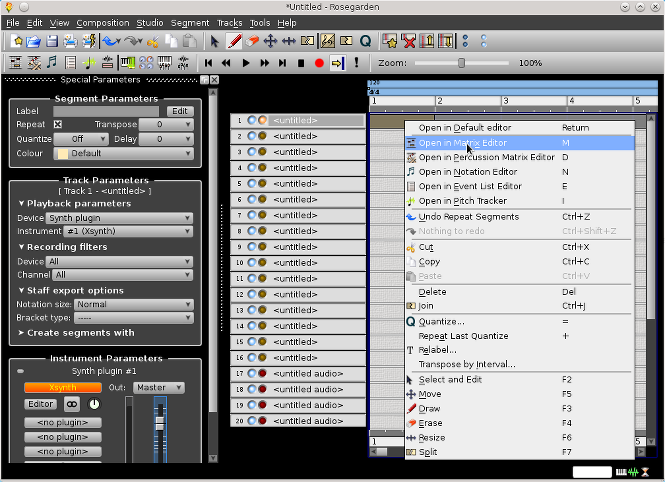 Particularly in 'Sequencers' you'll find digital audio workstations (DAWs) including Ardour. The Jack session manager, QJackCtl, has its own shortcut in the Favourites menu. Right click on red track next to the 'tempo' to set... the tempo! 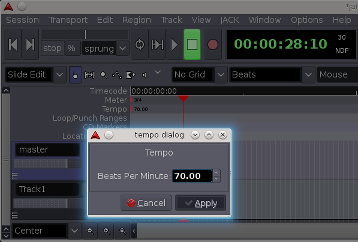 I think you can also use this slider to set tempo changes during the piece. You can do the same with the 'meter bar'. A click track is one thing, but you might want to use a reference track instead. Of course you can import this or record it separately, but there's another trick you can do if you want to record from something like Skype or Youtube while recording your own mic or instrument. This isn't as complicated as it looks! I've added two buses to the Ardour session and set both to record (the guitar track is mono). I've also named them because it makes working out the connections simpler. In QJackCtl the 'system capture' is routed to 'Guitar/in 1' in Ardour, the pulseaudio outputs are connected to the Ref/in channels 1 & 2. At the bottom right you can see pavucontrol (the pulseaudio volume control), I've opened this to make sure the output from the source for my reference track is using the 'Jack sink'. 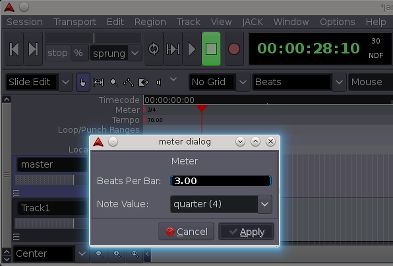 Remember you can look at the Ardour level meter to see that recording tracks are picking up input. Finally, so I can hear everything through headphones, both 'system capture' and 'pulseaudio JACK sink' are also connected to system playback. 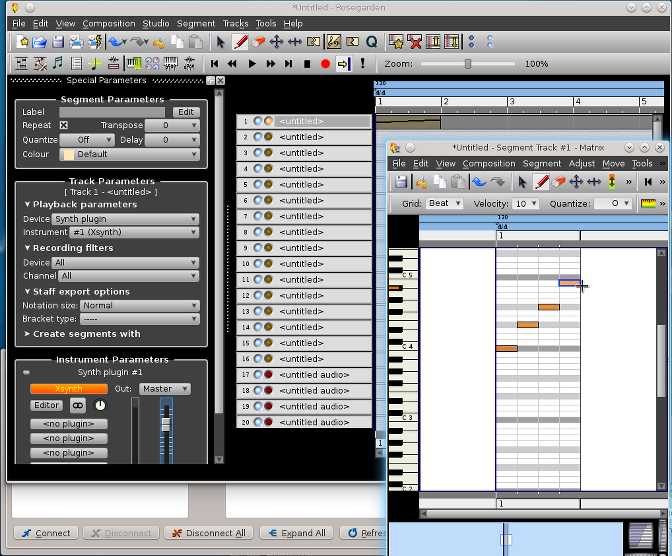 Click in the sequencer window (next to track 1 "<untitled>") to create a segment, then right click on it to get the matrix editor. Then in the editor I've just done a simple arpeggio. Use QJackCtl to connect Rosegarden up to Jack and then click play. If you want to drive your neighbours mad then you can set this segment to repeat (see top left). To learn more see the Rosegarden manual. 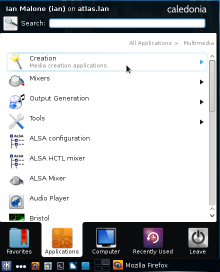 Skimming over all the other tools, Hydrogen drum machine, V1 Suite, NON, Guitarix, Rakarrack, many ladspa and lv2 plugins, and lots more, the last thing I'll mention is Dragon Player, which is just a simple media player, it's there because, sometimes, all you want to do is just play a track. And there you are; Fedora, Jam today. I see that you are using the Fender Mustang amp. (I also read an earlier post you did on this). I have benn breaking my head over this. 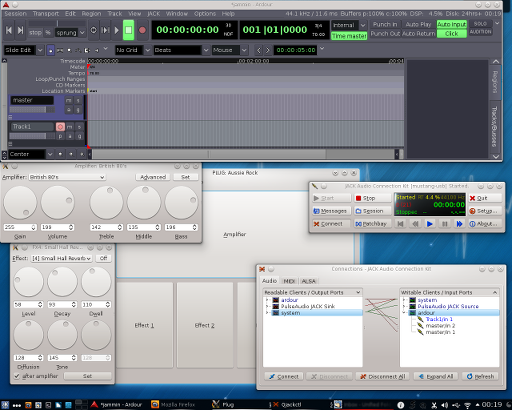 I use Ubuntu Studio (12.04) and Ardour 3, and have tried just about every imaginable variations, with very little success. Seems that it only wants to record when I choose Mustang Amplifier as an Interface in Qjackctl. Tried everything else (usb audio or Mustang amp for input) all I get is a new track where input seems to max out, with nothing on the recorded track itself. And in all those cases, no output whatsoever, even after exporting the damn track. Thanks for all the info you posted. Great site! Hard to say what's going on without a bit more detail. The good news is you can record via audacity, so drivers and hardware are okay. You'll get a meter (or do 'meterbridge -t sco x' to get a scope). You need to go to the Jack connections window in QJackCtl and drag the 'system' output to the 'bridge' input. Once you've done that the needle should respond to input. 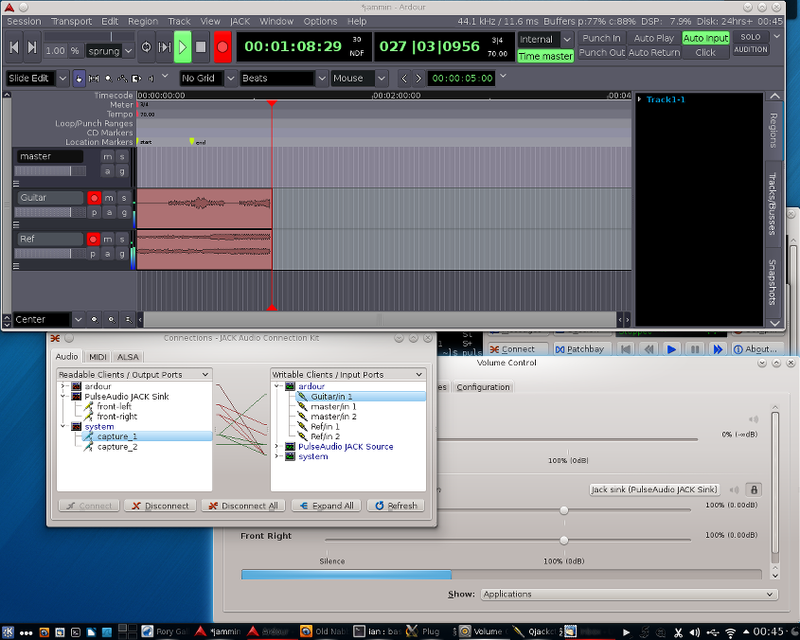 If it doesn't there's something wrong with the Jack setup, if it does then you have a problem with Ardour.